This is the third version of the Penguins Attack tower defense game and the goal remains the same. The penguins have build some awesome tanks and robots which they want to get past your security lines. 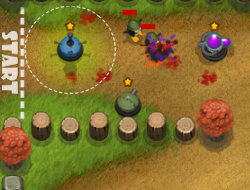 Prevent them from doing that by building lots and lots of turrets in their paths. If you feel like you have enough money you can choose to either build more turrets or upgrade the ones you already own. Keep in mind you will have to move fast as they will too. See which path they will take and place your towers wherever you think it is more efficient. Penguins Attack TD 3 0.00 between 0 and 10 based on 0 votes.